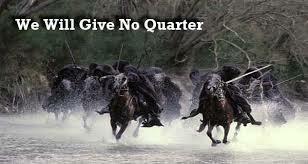 I’ve declared this season as the quarter of quarter. My energy has been flagging and I’ve been feeling increasingly resentful of many of my commitments. I’ve decided that it’s time for a change. I’m going to take the next three months off from anything that I don’t really, truly want to do. Well, outside of working hours – my bosses would probably stop paying me if I took a work holiday too. Personal stuff, that’s a different matter. If it’s not fun or rewarding, I’m hitting the pause button until January. I’m hoping the pause in my frenetic pace will help me find my energy to tackle new and exciting directions in January, and will provide a nice break from the status quo. One of the joys of being childless is that there’s no one who will be particularly harmed or stunted by this decision, and it gives me some mental space to recuperate. Like an exhausted steed that has just run 700 leagues, or a soldier who survived the great battle…I’ve been struggling to muster focus or excitement for months. I think my new job, some freak health issues (mostly cleared up now, thank goodness) and the recent pace of change in my life has drained a lot of my personal energy. Rather than trying to push through (the Wendy standard tactic) I’m just going to give myself permission to be lazy, disengaged, and even occasionally selfish. Until January, because I couldn’t possibly take a permanent vacation. So, let the quarter of quarter begin! I started this morning off famously, by waking up at 5:40 for my 6 am spin class…and then staying in bed to read instead. I think this idea might be the best Christmas gift I could ever give myself.